Agnieszka Radwanska picked up her first title of 2014 by winning the Rogers Cup. No. 3 seed Agnieszka Radwanska grabbed her first title of 2014 by defeating Venus Williams on Sunday in the Rogers Cup final in Montreal, 6-4, 6-2. Williams led 5-3 in the head-to-head against Radwanska going into the final, but the world No. 5 had won their last two matches convincingly. Radwanska played with superior consistency, finesse and accuracy throughout the match. She had six break opportunities and capitalized on five, ending the match with 64 points compared to 44 for Williams. At 34 years old, Williams was seeking to become the oldest player ever to win the Rogers Cup. But exhausted by the almost 12 hours she spent on the courts this week, she struggled to summon the same game she displayed in defeating Angelique Kerber, Carla Suarez Navarro and little sister Serena Williams on her way to the final. Known for her powerful serve, Williams only hit one ace and made six double faults in the championship match. She put just 46 percent of her first serves into play and converted on only two of 10 break-point opportunities, with her power often undermined by the consistency of one of the best returners in the women’s game. 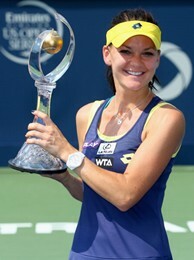 With the win on Sunday, Radwanska grabbed her fourteenth career title and jumped to No. 2 in the Emirates Airline US Open Series Bonus Challenge Standings. World No. 1 Serena managed to hold on to her lead in the race with a semifinal finish this week. Organizers announced that this year’s tournament drew 181,996 spectators, topping the previous high of 175,000.